Traveling exhibit gave people a chance to enjoy the Old Sculpin collection without traveling to downtown Edgartown. The Old Sculpin Gallery’s traveling exhibit saw some extra traffic last week as voters filed in and out of the Oak Bluffs Public Library to cast their votes in the state primaries. Seven works depicting scenes from around the Island hung above the wooden booths as Islanders voted throughout the day Tuesday. The library’s downstairs meeting room is the last stop on a six-month tour that began at the Featherstone Center for the Arts in Oak Bluffs and made its way to Edgartown and Vineyard Haven this summer. The exhibit celebrates the 60th anniversary of the Martha’s Vineyard Art Association, based at the Old Sculpin Gallery in Edgartown. Among the selections in the traveling show are works by the association’s founders and early members, including abstract artist Vaclav Vytlacil, who was a student of Hans Hofmann; silkscreen artist William Abbe; and the artist and architect Joseph Hazen, who designed several homes on the Vineyard. 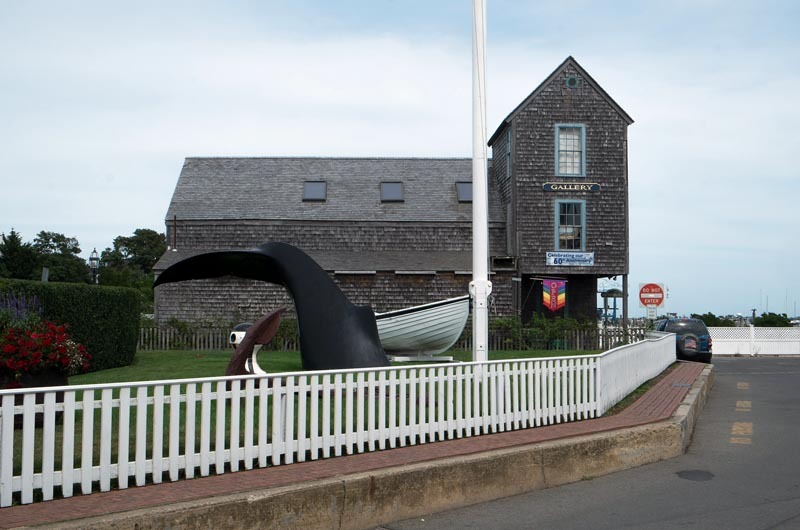 Gallery manager Jennifer Bottone, who selected the works from the gallery’s permanent collection, said one of the goals was to reach a wider audience during the busy summer months, when it can be difficult for visitors to drive into Edgartown. The selections include Mr. Abbe’s stencil-like rendering of Victorian woodwork around the Tabernacle; Mr. Vytlacil’s bold abstract painting The Fisherman; and Mary Drake Coles’s whimsical Bathing on Chappy. Ms. Coles lost her sight to glaucoma in the 1950s, and as the result of childhood polio could use only her right arm. Mr. Vytlacil was her first teacher. Patricia Reeve Mead, a graphic designer, painter and teacher, is the only living artist featured in the exhibit, which spans several decades. Her mother in law, Ruth Appledoorn Mead, whose work is also featured, was the association’s founding president. Both studied at the Art Institute of Chicago. Ms. Mead remained devoted to the association into her 90s. Other events this summer highlighted the association’s efforts to reach a wider audience. In partnership with the Preservation Trust in July, Painting the Vineyard involved community painting trips to several Trust properties, including the Flying Horses Carousel in Oak Bluffs and the Old West Tisbury Library. An annual fundraiser in June at Flatbread supported scholarships for Island high school students. Ms. Bottone hopes to expand the association’s reach into the off-season with talks, presentations and workshops for Island residents and students. An exhibit this fall at the Old Sculpin Gallery will feature about 60 works by the association’s member artists. The Old Sculpin Gallery’s 60th Anniversary Traveling Exhibit will be at the Oak Bluffs Public Library through September. For more information, visit marthasvineyardartassociation.org.